Where and Why a Super Air Knife? Look around your plant for these air saving and maintenance saving opportunities which are well suited for a Super Air Knife. Do you have long manifolds with multiple nozzles installed on it? Such manifolds are large air hogs and Super Air Knives can typically cut the air consumption by more than half. Have you calculated the air consumption of your large manifold? Look for simple pipes with holes drilled in them. These pipes generally have a number of qualities which a Super Air Knife will improve; the first is lowering air consumption, the second is lowering noise levels, the third is providing and OSHA safe blow off. Have you been visited by OSHA yet? Any wide area blow off application could benefit from a Super Air Knife. Typical wide areas include webs of all different materials as paper, metals, plastic films and wood among others. The Super Air Knife is available from stock in lengths up to 96″ but are made even longer per request. Also applications where space is limited. Aluminum Super Air Knives have a dimensional profile of 1.75″ (45mm) x 1.44″ (37mm) with the stainless steel version even smaller. And by running from compressed air, 1/4 NPT connections dictate a small supply line when compared to a blower option. Are you having trouble providing a blow off in a cramped space? So, there are a few examples of where you can look for Super Air Knife opportunities. Here are a few reasons why you should use a Super Air Knife, some of which have been mentioned briefly. A Super Air Knife is the most efficient compressed air knife on the market today, with superior flow characteristics of any competitors knife it consumes the least amount of air. They are OSHA safe for noise. Super Air Knife is incredibly quiet. It produces 69 decibel at 80 PSIG of inlet pressure. Generally not even noticed in your typical industrial environment. They are OSHA safe for pressure; engineered to meet the OSHA dead-end pressure standard 29CFR-1910.242(b). This means the exhaust air is below 30 PSIG and cannot be dead ended which both avoid potential harm to staff. 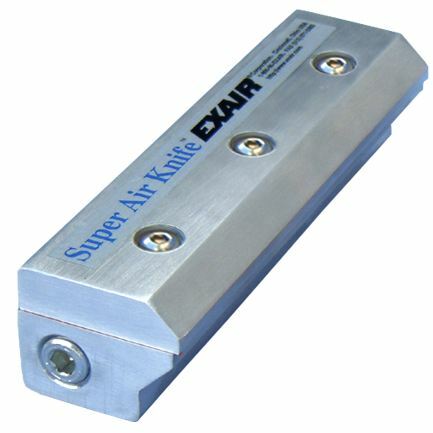 EXAIR Super Air Knives are LOW maintenance, no filters, no bearings, no large footprint and no large duct work to mess with like with blower operated air knives. Once Super Air Knives are in stalled, the compressed air filter/separator is all you need to look at, typically replacing the filter element (which we stock) at 6 month intervals. So keep you ears and eyes open for loud and large blow off applications in your plant. EXAIR will help reduce both your consumption and noise levels. Previous Are you ready for some good news?